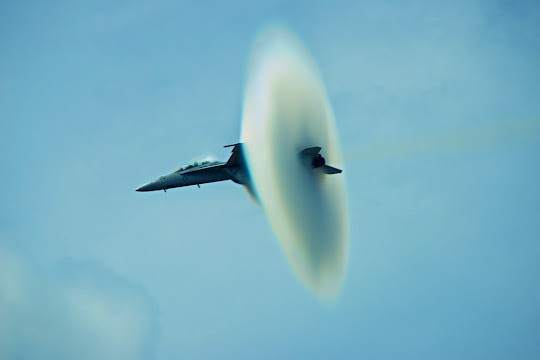 A photographer spent five years attempting to photograph the moment a jet breaks the sound barrier and finally succeeded, capturing the split-second moment the aircraft reached “transonic velocity,” or the speed of sound at 766 mph. Joe Broyles, 61, attending an air show at the Oceania Naval Air Station in Virginia Beach, Virginia, picked a spot in the sky and snapped eight images in less than two seconds, hoping he’d get lucky, according to Caters News Agency. “They move so fast it’s near impossible to time when to start pushing the shutter button,” Broyles told Caters. Luck was on his side as Broyles captured the moment an F-18 Super Hornet 2 jet broke the sound barrier, forming a vapor cone around the jet that lasted tenths of a second. Broyles had been to several air shows in the past attempting to get his tough-to-get photo. Not only is it difficult because of the speed of the aircraft but so is judging the height that the jet will pass overhead. Now he’s finally experienced success.